This crimper is designed for working with red, yellow, blue insulated terminals. Will cover AWG of 10-12, 14-16, 18-22 nylon and vinyl. Perfect for those working with electrical and industrial terminals. The ergonomic handle provides user comfort over many crimps. 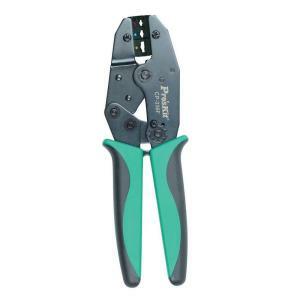 The ratcheting handle ensures a proper crimp is made every time. Tbook.com crawls the web to find the best prices and availability on Crimpers and related Tools and Hardware products like Pro'sKit Ratcheted Crimper for Red/Blue/Yellow Terminals. For this page, related items include products we find that match the following keywords: "Crimper" at our vendor partner Home Depot. Pro'sKit Ratcheted Crimper for Red/Blue/Yellow Terminals is one of 41 Crimpers and related products listed in the Tools and Hardware section of Tbook.com If you have any questions on this product, please give us a call at 734-971-1210 during the hours of 9am - 5pm EST for assistance. Thank you for shopping at Tbook.com, the Internet Department Store!